Haunted Mansion New Orleans Square attraction at Disneyland, supposedly the home of 999 ghosts with “always room for one more, ” opened on August 9, 1969. The mansion had actually been built in 1962-1963 but work on the interior was first halted by the 1964-1965 New York World’s Fair. Then Disney designers could not decide on what to put inside, so guests were simply tantalized by a promise of an attraction to come. At one time, it was thought that there would be a walk-through attraction, but it was realized that there would be traffic flow problems. The advent of the Omnimover—here “Doom Buggies”—provided the solution. 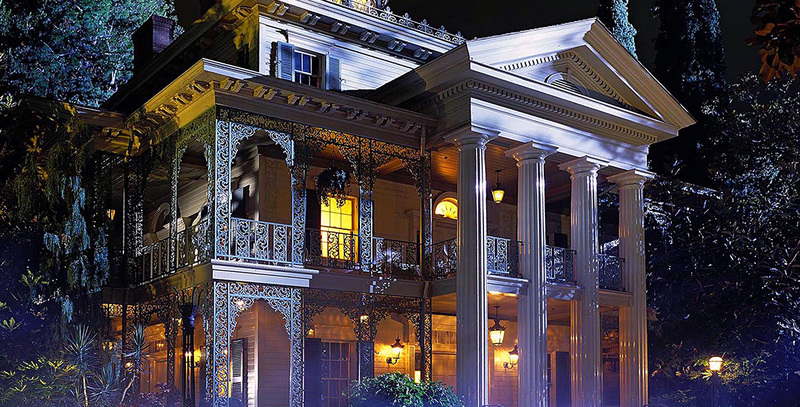 From the outside the Mansion looks elegant; some designers wanted it to look ominous and scary, in a state of disrepair, but Walt Disney said that he’d keep up the outside and let the ghosts take care of the interior. Within the house, guests hear narration by Paul Frees as they ride past a number of spooky exhibits and special effects that defy explanation. In Liberty Square at Magic Kingdom Park at Walt Disney World; opened October 1, 1971. Also in Fantasyland at Tokyo Disneyland; opened on April 15, 1983. See also Phantom Manor for the Disneyland Paris version. The only major attraction in four different lands in the four Disney parks. The Haunted Mansion at Disneyland was changed to a holiday theme of Tim Burton’s The Nightmare Before Christmas, beginning October 5, 2001, and repeated in later holiday seasons. A Japanese version, the Haunted Mansion “Holiday Nightmare” began at Tokyo Disneyland on September 15, 2004.